Updates 11 Oct 2011 07:38 pm by David ! 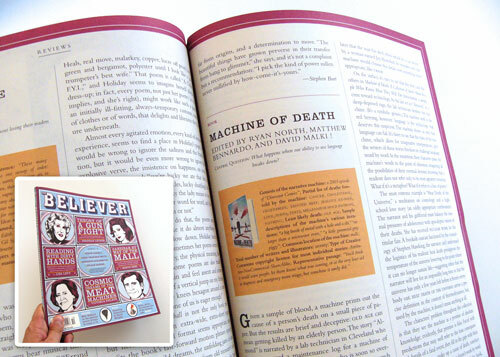 The October 2011 issue of The Believer features an extensive and fascinating review of Machine of Death, exploring the way that the machines in the book use language, in a very human and un-machinelike way, to toy with the humans themselves. 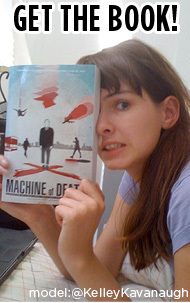 The Believer doesn’t post their reviews online, so I won’t reprint it here, but here’s a taste. If you happen to see the October issue on the newsstand, pick it up for its great interview with Steve Carell, or adaptation of the Victorian adventure tradition to the exploration of a shopping mall, and read the MOD review while you’re at it!